The following is an alphabetical list of most of the financial institutions that have been located in St. Louis Park over the years. There is more to add, and if you have any additions or corrections please contact us! Associated Bank, 5353 Wayzata Blvd., acquired Park National Bank in about 2000. Bell Mortgage, 1000 Shelard Pkwy, Ste 500. Bell Mortgage was founded in 1880 by early Minneapolis leader David C. Bell and is the oldest and largest independent mortgage banking company in Minnesota. BMO Harris Bank, 5775 Wayzata Blvd. Citizens State Bank was first located at 5001 Excelsior Blvd. It opened for business on January 16, 1950. First Bank Produce was located in the Park Place Office Center, 5775 Wayzata Blvd. The bank was chartered in 1923 to serve the produce and meat merchants located round 1st Avenue in Minneapolis. The St. Louis Park branch opened in the fall of 1980. First Federal Savings and Loan was at 5501 Excelsior Blvd. First Western State Bank opened in a new building at 8800 Highway 7 in 1972. Opening giveaways included a new yellow Saab and 500 lbs. of steak divided between 30 winners. It was formerly Park Plaza State Bank. In the ads, the “I” in the word First was a cowboy boot. 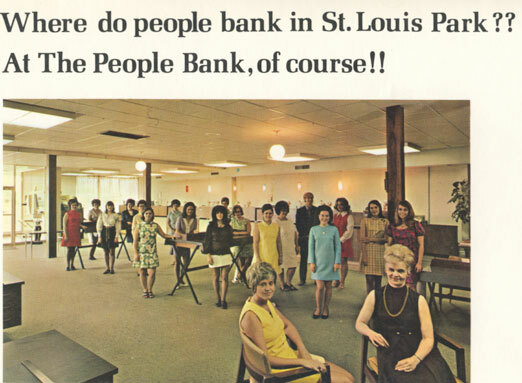 A 1974 ad boasted a six-lane auto bank and a “ready cash machine.” It was still there in 1978. Home Federal Savings and Loan was located at 3915 Highway 7. It opened on June 10, 1969, and at the time it was one of six branches. It boasted an “online” computer teller system. It was there until at least 1979. Midwest Federal opened its 19th branch at Knollwood (3670 Aquila) on June 26, 1981. Wikipedia: Midwest Federal was in business for 99 years until its failure in 1989. Its collapse was due mostly to bad real estate loans. Many of the bad loans were to mobile home owners. On the opposite scale were the unsecured loans to the Jockey Club of Miami, a resort in Miami, Florida, beginning with a $6 million loan in 1975. The bank continued unsecured loans to the resort until its collapse in 1990.On April 22, 1991 the St. Paul Pioneer Press called the bank’s failure the “largest financial disaster in Minnesota history” and was part of the savings and loan crisis of the 1980s. Midwest Federal had assets of $3.5 billion and was liquidated by the Government at a cost of $1 billion to taxpayers. Midwest was $1 billion in debt when it was seized by regulators in February 1989. The former chairman, Harold W. Greenwood Jr., Donald J. Snede, Charlotte E. Masica, and Robert A. Mampel were indicted on Federal fraud and conspiracy charges involving financial losses at the failed institution. After its collapse, Midwest Savings was eventually placed under the “conservatorship” of the Resolution Trust Corporation until its deposits were sold to various parties. The largest share of Midwest’s deposits – $638 million – went to Minneapolis banker Carl Pohlad, whose Marquette Bank Minneapolis bought the deposits of eight branches for $3.2 million. It had a cool building, though. 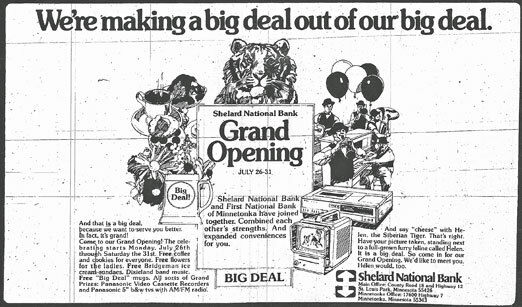 Midland National Bank of Minneapolis held its Grand Opening from July 8-18, 1981 at 3601 Park Center Blvd. Festivities included free ice cream and hot dogs, the pop sounds of “Monday’s Men,” the St. Louis Park Community Band, the Americana Brass, Minneapolis Commodores Barber Shop Chorus, Riverboat Ramblers Dixieland Band, Jaguar Club display of 16 Jaguars and an “Auto-Rama” classic car display featuring a 1909 Hudson, representing the year Midland Bank was founded. The bank underwent a major expansion and remodeling in 1982 and had a Grand Expansion Celebration on June 19-26. By 1998 it was a branch of Norwest Bank. Minnesota Federal opened June 24, 1966 at Knollwood Plaza, 8600 Highway 7. Office manager was Roger Johanson. By 1998 it was a branch of Norwest Bank. 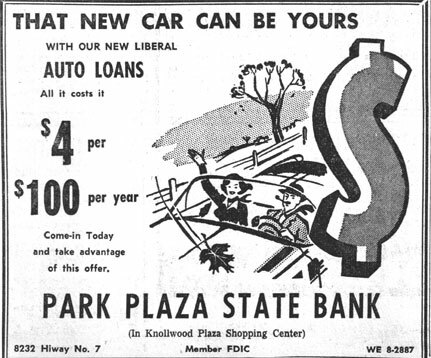 Park Plaza State Bank was located at 8232 Highway 7 (Knollwood Plaza) from 1955 (original tenant) to 1972. Its original president was Walter Zastrow. It was the first business to open at Knollwood, opening on March 21 before the center was officially opened because of requirements of its charter. 1971 Park Plaza Officers: D.L. “Don” Paulson, E.J. “Ed” Tierney, Warren C. Leininger, Richard E. Palmer. 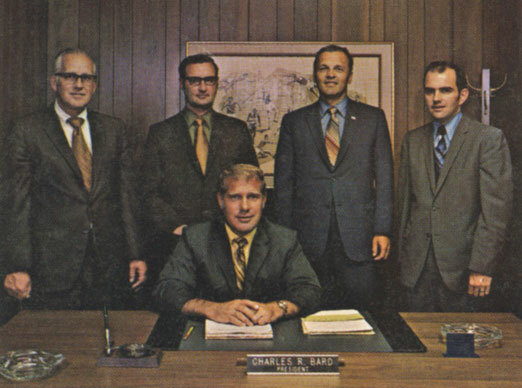 Seated is President Charles R. Bard. In 1972 Park Plaza moved to 8800 Highway 7 and changed its name to First Western State Bank (see above). Park National Bank was located on Wayzata Blvd. St. Louis Park State Bank, 6400 Walker Street, began in 1915 but went broke in 1919. Be sure to read the full illustrated story! SharePoint Credit Union, 3670 Aquila Ave., in the old Midwest Federal building. SharePoint was established in 1933 by a group of Red Owl employees and is now open to anyone who lives, works, worships, volunteers or attends school or conducts business in Anoka, Dakota or Hennepin County, Minnesota. There are other locations in Andover and Burnsville. Shelard National Bank received its charter in @ 1971 and was located on the first floor of the first Shelard Park Office Building. In July 1982 Shelard National Bank merged with First National Bank of Minnetonka (ad below). The bank was sold in 1987, at one point became First Star, and is now part of U.S. Bank. Twin City Federal Savings and Loan. Follow the link for history and photos of this Knollwood institution. An early (possibly the earliest) credit card used in the Park was the Minneapolis Charga-Plate Service. It consisted of an embossed metal frame (like a tiny car license plate) with a paper card that said Charga-Plate Stores of Minneapolis “Carry This Charga-Plate Always” The holder would then sign the card. Married women were usually required to use their husbands’ names. In 1974 the Equal Credit Opportunity Act made it illegal for credit card providers to require women to get credit cards in their husband’s names. Farmers and Mechanics Savings Bank, located in downtown Minneapolis, was the repository of the school savings of thousands of St. Louis Park kids, starting in May 1924. The building is now a hotel and some of those savings are dust. The bank’s current iteration is U.S. Bank, and students who didn’t get their money should check for unclaimed money with the state.